BrownBark Tree Service is a family-owned & operated business in Clarion County, PA.
Ryan Brown, climbing arborist and co-owner, started his career in trees as a wild land firefighter in the state of California (that's a massive redwood in the picture above). His skill with a chainsaw quickly became apparent and Ryan joined the rank of squad boss and eventually earned his Class C Advanced Faller certification from the US Forest Service. ​Ryan's travels later took him to Charlotte, NC. Here he teamed up with Mary, who was working in neurology research at the time, but had always dreamed of being a business owner and working for herself. 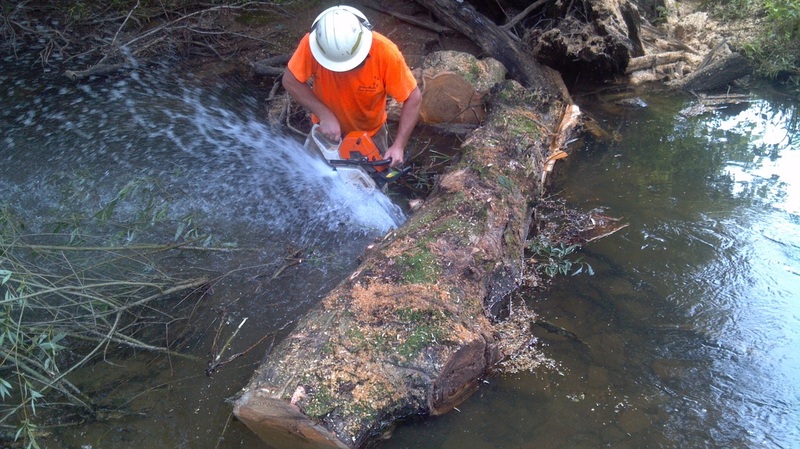 ​Putting his skills and expertise to use, Ryan began working for a local tree service. An avid rock climber, he was eager to learn more about safety and the different techniques used by the climbers on the crew and quickly became an expert tree climber himself. At this time he also began studying to complete the Arborist certification exam. With her organizational skills & business savvy and his skillfulness & talent, Ryan and Mary moved back to their home state of Pennsylvania to open their business--BrownBark Tree Service. BrownBark specializes in trees of all sizes, but most importantly those hard-to-get-to trees. Being a professionally trained climber gives Ryan the ability to trim and remove trees that would not be accessible ​to companies who use bucket trucks alone. Our quality shines through, and we invite you to view some of our work on our Photos page. We offer affordable rates and free estimates. "Don't wait until it's too late, call BrownBark today!"